2 labyrinths found. Showing 1-2. Sorted by country, state, city, then zip/postal code. Outdoor labyrinth to the north of the A frame chapel of the church. Accessible anytime snow does not cover it. adaptation using stepping stones in place of the usual path. 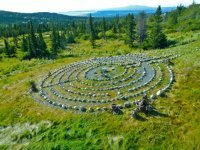 Labyrinth with views beyond S.Anchorage to Cook Inlet. Wheelchairs are possible if they have chunky wheels, go all around back of house to avoid large hill... it is possible. Text or email ahead of visit for current updates or scheduling. Our 50 foot labyrinth is in front of our semi retired guest house with long term residents. Park on upper driveway or further from home. Enjoy your visit - late summer visits in long days is wonderful! Weather permitting. it is in a wild windy beautiful Alaskan Valley with hills and mountains adjacent. 5-circuit medieval, modified due to path widths and our terrain. 61 04.24 N° Lat. ; 149 43.15 W° Long.